I think people might be tired of this. Or maybe it just slipped their minds. But as is tradition, every performance motorcycle launched in India gets compared to the RD350, such is the scary two-stroke’s reputation. Its powerband has scarred many a generation of thrill-seeking motorcyclists for life. Or maybe we just can’t help running back to the RD at regular intervals for a fix of 2T smoke. But when Yamaha itself launches a parallel-twin performance motorcycle in India, there’s a bit of inevitability to this pairing. Thirty-two years separate the Yamaha RD350 and the Yamaha YZF-R3 (which, incidentally, is exactly how long I’ve been around for). The similarities obviously end at the fact that they both have parallel-twin motors helped by 6-speed gearboxes. And that they’re both made by Yamaha, of course. 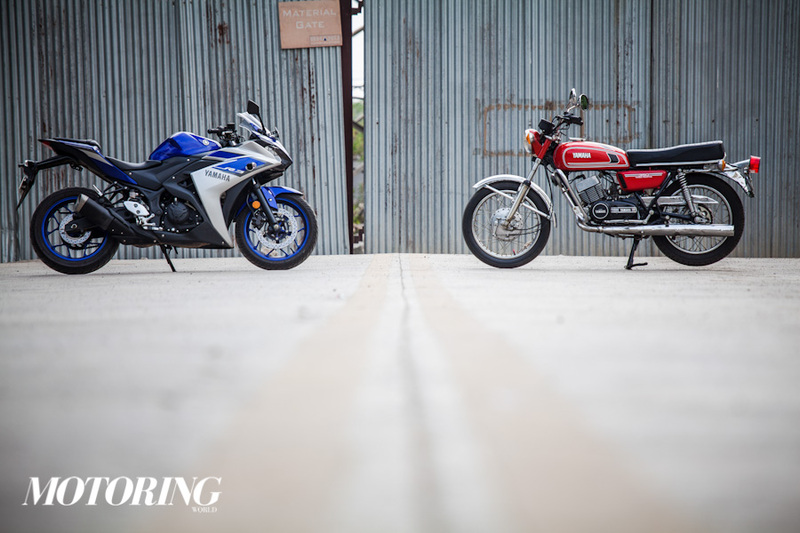 However, the contrast between these two motorcycles is a study in how far Yamaha — and motorcycles — have come in the past few decades. It’s also the setting for one of our favourite themes in motorcycling: two-stroke vs four-stroke. The RD was never badged a Yamaha RD350 in India; it was sold as the Rajdoot 350 by Escorts who brought it to India under license from Yamaha in 1983. Even though it was essentially a bike from the ‘70s, the RD was still ahead of its time when it landed on our shores. People expecting performance similar to the Enfield Bullet 350 due to the similarity in displacement figures were subject to rude shocks. We got an RD that was based on the Yamaha RD350B which made 39 bhp. However, the first Indian version, called High Torque (HT), made 30.5 bhp in the interest of better fuel efficiency, and towards the end of its production run in 1989, it also saw a Low Torque (LT) variant that made 27 bhp. Fuel efficiency from a 350cc two-stroke… well, they tried. The RD and the R3 look worlds apart — and that’s probably because they are. The sight of the RD350 is like an old tune that you somehow forgot. It’s a simple shape that does full justice to the word ‘motorcycle’ and boasts the symmetrical benefits of two smoking exhaust pipes. The R3, meanwhile, is a relative miniaturisation of Yamaha’s current flagship sportsbikes. And that’s not a bad thing at all. It looks ready for 46 track days the moment you set your eyes on it. Where the contrast applies most, though, is in riding these two. The R3 is the strong and silent type, a motorcycle that always has your back. It’s smooth, confident and fast without being scary. Heck, even its riding position/ride quality combination is extremely liveable with on a daily basis. The RD, on the other hand, is very much a product of its times. It doesn’t seem like it exited the gates of a motorcycle factory; it was thrown out of a loud and crowded bar for causing too much trouble. Once you kick it to life, it’s loud, threatening and everything that today’s motorcycles aren’t. Every strand of hair pushes against the riding gear you wear. This particular HT is still smooth once you get going and its gears still click into place as they were meant when it was made. However, that throttle may look like any other, but it’s far from a regular innocent mechanical system. It’s a portal to two-stroke insanity and the feeling of opening it never gets old. It fills my helmet with a roar that resonates with a hunger for speed. It is two-wheeled magnificence, nothing else. You are always running out of road before you run out of power. Unfortunately, you’re running out of road when it’s time to stop, too. The RD may be a Japanese motorcycle, but it’s actually a bit American in nature — a fast motor shoved into whatever allows them to sell it as a complete vehicle. Forget optimising frivolous details like handling and braking. The brakes are good for about 30 per cent of speed that the RD is capable of. Above that, it’s a process that involves choosing the correct trajectory, turning your upper body into a sail and hoping for a strong headwind. The RD can still handle reasonably well, though, but the fear of not stopping is enough to overcome my greed for going faster. The R3 finds itself bestowed with years of technological advances and refinements. After the RD, the R3 feels like you’ve travelled through time and are eternally grateful for it. It does everything you expect it to and there are no surprises engineered into its dynamic abilities. The R3 flies forward, brakes hard and turns beautifully, so it does two things more than the RD can. It’s a friendly companion, one on which you can learn going properly fast on. However, the RD was and will remain the most potent motorcycle of its time and the hairiest two-stroke sold in India. It made men out of many boys who swung a leg over it back in the day. The RD is irreverent and irresponsible, the kind they don’t make anymore, a bike that isn’t averse to roughing you up if you treat it with anything but respect. Despite its age, the RD350 still hasn’t grown up. Next to the RD, the R3 comes across as a focussed teetotalling gym instructor with a shaved chest, one who’s always helping you out. Nonetheless, despite the years between them and the completely different states of mind they put you in, both of these are, above all, fun motorcycles. They’re born from the same tuning forks and though they differ in frequency, their pitch is very much alike. I’d have loved to see the R3 with an extra 30cc, reincarnating the RD350, and Yamaha could’ve watched the bike fly out of showrooms faster than it could say ‘a legend reborn’. But the prospect probably didn’t suit the suits at Yamaha, even though my mind is made up that at least one nostalgic person at Yamaha must’ve pleaded for it during the R3’s development period. At least I hope so. Wishes aside, nothing’s really lost except a name; the R3 is as fitting an heir to the RD’s legacy as there can be. And the ghost of the two-stroke past can finally be laid to rest.